If you find yourself becoming more and more interested in the complex nature of space and dimension, you will most likely want to check out some of the varied topological structures. Topology “studies properties that are preserved under continuous deformations, including stretching and bending, but not tearing or gluing” (Wikipedia – Topology, 2013). Basically, it is the study of continuity and connectivity. A common joke is that a topologist does not distinguish a donut from a coffee mug because the doughnut could be reshaped to form a coffee cup – see animation below. 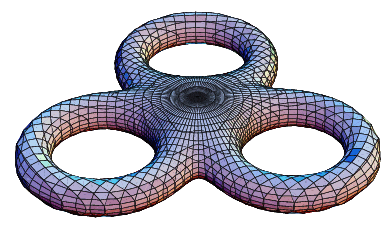 Topological Structures such as the Möbius strip and the triple torus can help you see how the topology is complex and not so structured as Euclidean geometry might have us think. I’m not in a position to explain topology, but there are a few resources you might find helpful on your quest (if you decide to delve into this area of mathematics). A great introduction is an essay by Neil Strickland. There is also a book (topography abridged book) written by Viro, Ivanov, Netsvetaev, Kharlamov. Check out many more examples from the Wolfram MathWorld site.